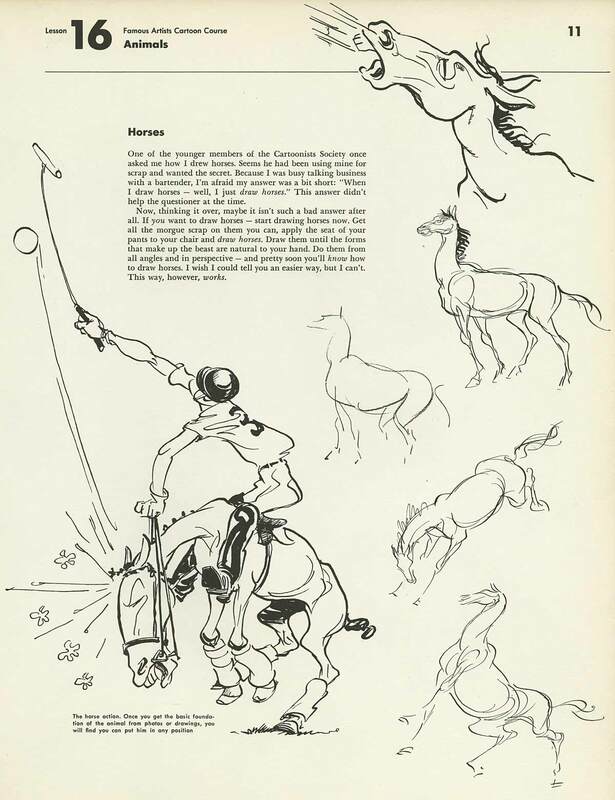 Today I’m going to be showing everyone my planning process for using photographic reference to plan and execute a naturalistic horse run cycle. This process has been used by generations of artists to help analyse and capture the motion patterns of real-world objects and creatures. This type of study is invaluable for building an internal “motion library” in your mind, so that when you have to make guesses about how something impossible might move, those guesses can be as educated as possible. For the beginning animator, doing motion analysis can also help give a stronger sense of what motion details matter, and which are best to remove to get an optimal stylistic motion. In a complex cycle like a horse gallop, there are many things to understand, and without experience animating similar creatures it would be difficult to plan ahead for this animation considering that we have so much to keep track of. If you can film your own reference, then that’s a great first step, but if you can’t, the first place I search is the BBC Motion Library at Getty Images. This collection has thousands of real-time and slow-motion shots of sports, nature, vehicles, and much more. 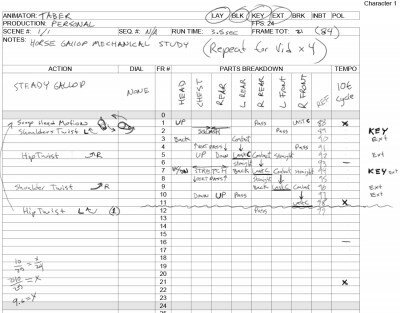 It’s free to view and download, which is ideal as we will need to carefully go through our shot frame by frame in order to analyse it. Here is the shot I used for reference. As stated above, it’s free to download (non-commercial use of course) by right clicking the clip and choosing Save as. Next we need to be able to see each frame of the video one at a time. You can do this by importing the footage into any video editing software if you have it. I prefer to use a much simpler method by opening it in QuickTime. 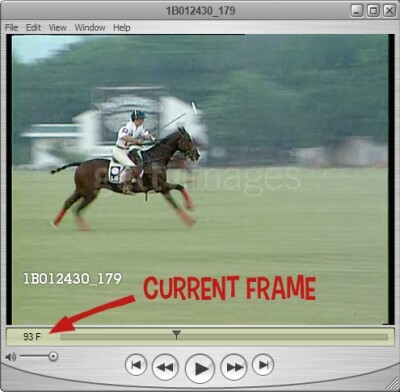 To my knowledge, QuickTime is the only freely available video software which allows you to step through a video one frame at a time (using the left and right arrow keys). Many others allow you to skip several frames, but none that I’ve found allow this level of precision. 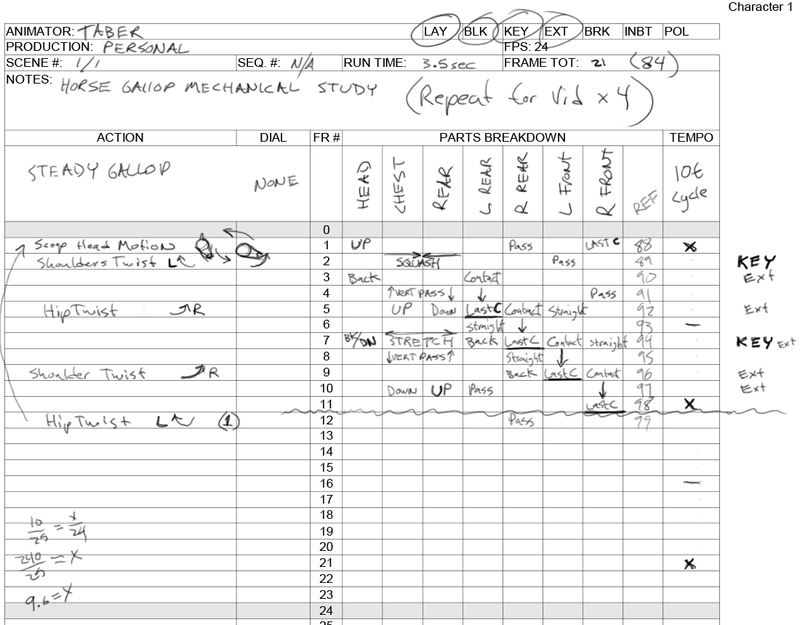 Another benefit of this software shown above, is the ability to switch the timecode to frames, so we can easily count and locate keyframes in our action. Before using the shot for any timing information, you’ll need to know the frame rate of the video. I figure this out by going to 1 second in the timecode, the switching to frames to see how many have elapsed. This shot is in a standard 25fps for european PAL broadcast. This will effect our conversion to our frame rate. In my case, I’ll be animating at 24fps (see the conversion math later on at the bottom of my Xsheet). Although we could use a single source of reference, it’s better to have several similar sources to draw from, and the plates from Edward Muybridge’s animal studies have been a source of inspiration to animators for a century. 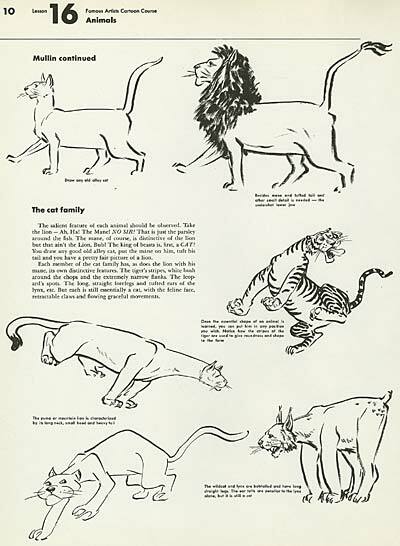 We have an extensive library of Muybridge here. 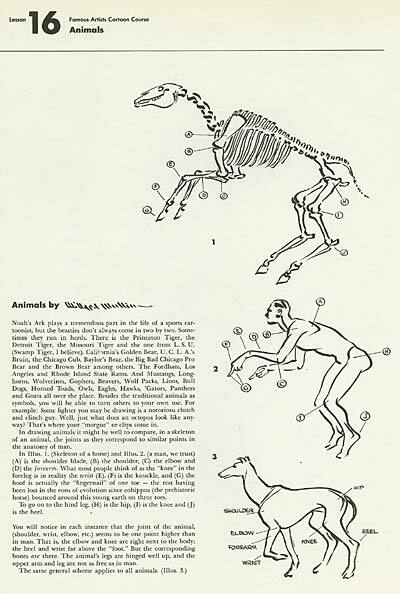 These images (shown at top) are invaluable because they show a flat sideways perspective of a horse galloping with extracted frames to display the entire cycle of motion. The only problem with this is that we don’t know how fast it should be moving, a problem we’ve already addressed with our video reference. 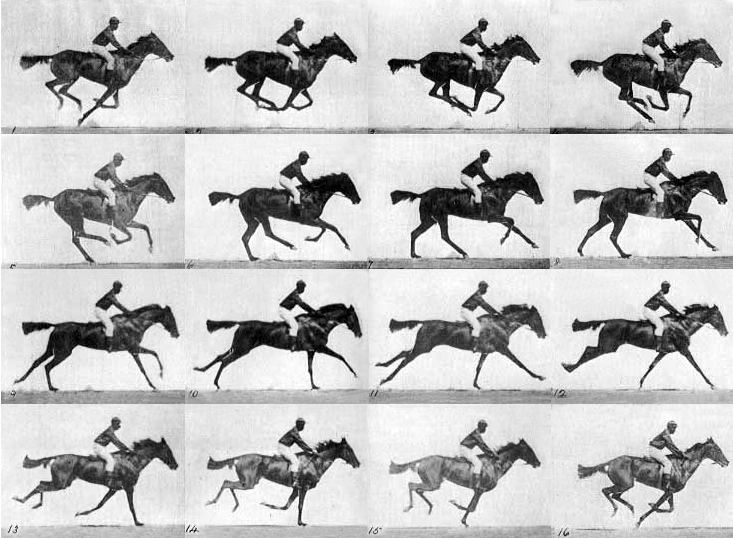 Here is a playback of the muybridge_horse set to a realistic 40fps. 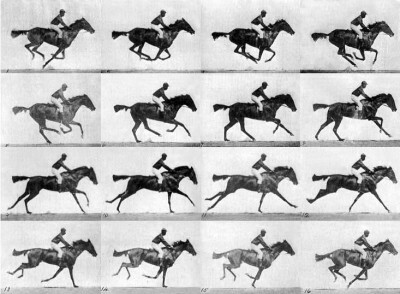 By comparing the frames to our video, I determined that the approximate speed of the original Muybridge shot was a brisk 40fps. I also adjusted the frames to stabilize the ground, put vertical and horizontal lines in to help track key parts of the body, and finally tracked each hoof with a colored ball. All of this information provides almost everything we need to put together our plan. The last bit of information we need is an understanding of the pattern we hope to find and reproduce. 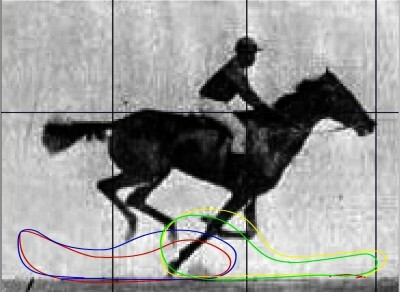 This information I found easily on an equestrian website, along with footfall patterns of all the primary horse locomotion speeds. Path of feet shown in color code through cycle duration. Finally we are ready to utilize all of this information into a formal plan for animating our horse. By stepping through the video and referring to the Muybridge plates, I record all of the pertinent information I can onto an Xsheet. 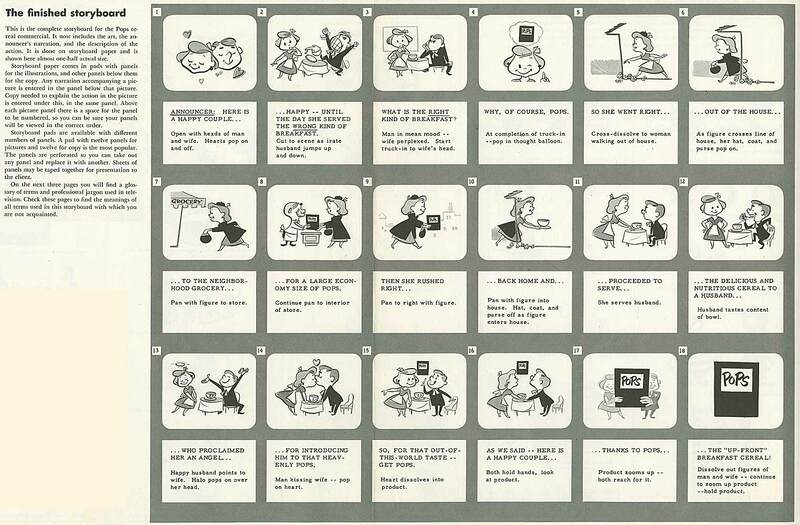 Key Frames – These should be the most informational single images for the action, without which, none of the remaining actions can possibly hope to illustrate the action properly. 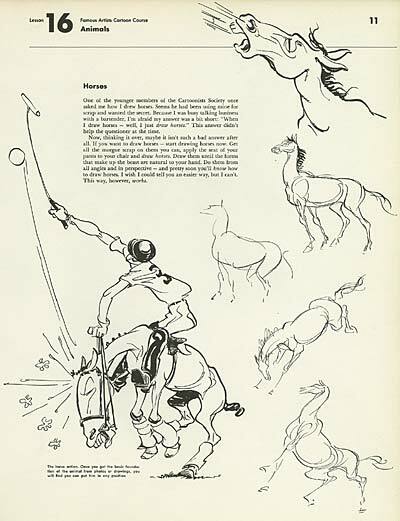 In my case, I chose the Squashed mid-air position, and the Stretched leaping position of the horse. Extremes -The foot contacts must all be present, as well as the maximum and minimum vertical positions of the chest and flank. Breakdowns – Wherever necessary, plan for the passing or half-way positions of body parts and poses, so you do not miss the nuance of the motion pattern. Small patterns– Note the path and notes about the head, these patterns are important and shouldn’t be missed. Make notes of any details you might easily forget later. For one reason or another, the use of Xsheets has never fully translated over to computer animation, which I think is a major loss. 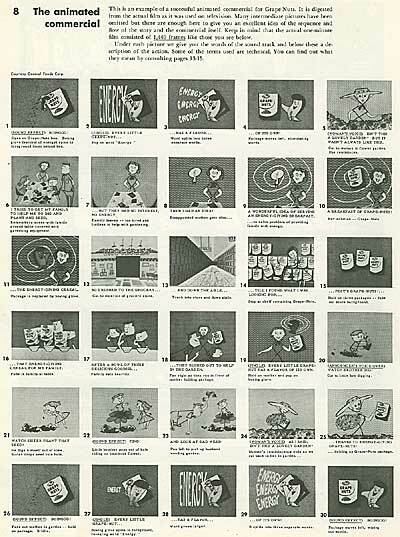 Although these sheets were originally used to plan for the exposure of cell levels in traditional animation, they can find a valuable second life in helping to plan body part motions and musical timing. 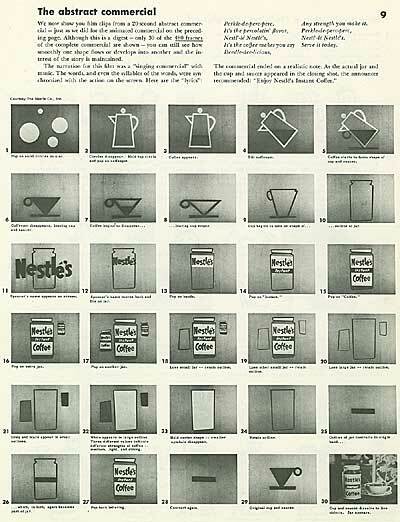 With all of this preparatory work, the only thing left to do is to use this roadmap to complete your animation. By this point, you should have such a solid idea of what your animation is going to look like, that the actual work of animation is almost an afterthought. In The Illusion of Life, as well as The Animator’s Survival Kit, the authors tell stories of their lengthy and strenuous planning procedures, and how once planned out, an animation scene was practically complete before pencil ever touched page. This method allows you to keep a solid focus on your scene even between work sessions, and frees you to focus on the details without becoming lost in the larger patterns of motion. 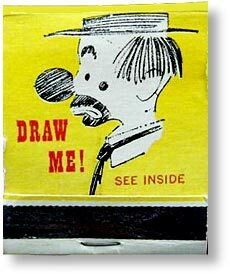 Remember those matchbooks that said “Draw Me!” on the front? They advertised a correspondence course called “Famous Artists”. 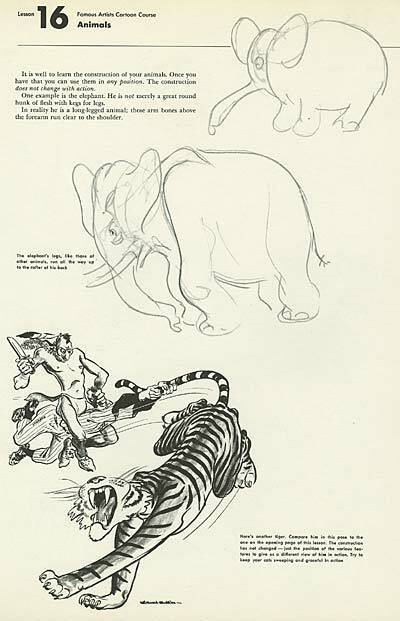 Everyone made fun of “draw Binky the Skunk any size but the same size”; but the truth of the matter was that the Famous Artists Course was no laughing matter- it was one of the best art instructional courses ever created. 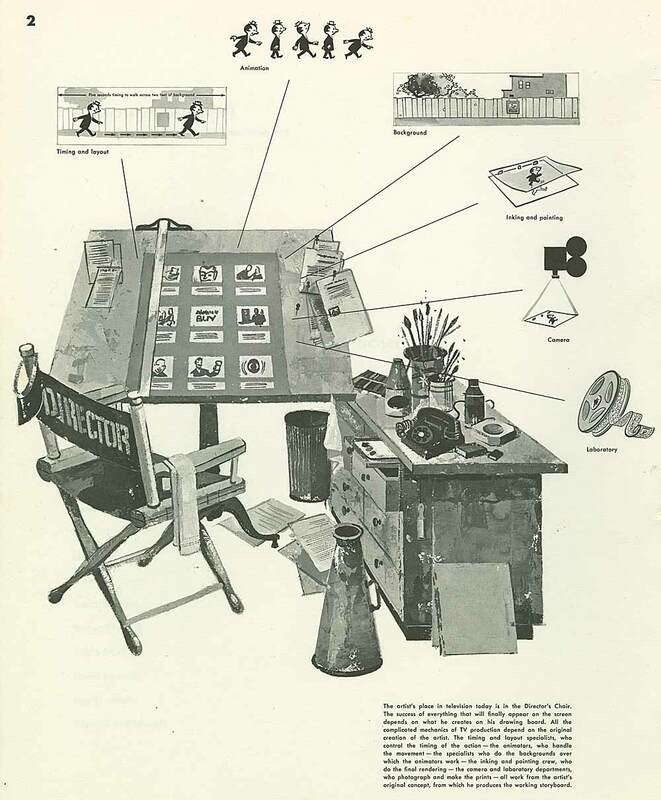 Founded by Albert Dorne and Norman Rockwell in the early 1950s, Famous Artists had three courses… Painting, Illustration/Design and Cartooning. 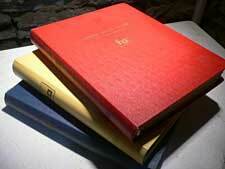 Each course consisted of 24 lessons in three oversized binders covering a wide variety of subjects. Each month, a new lesson would arrive in the mail. 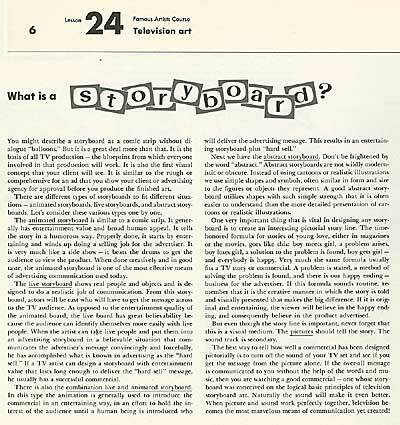 The student would read the program material, complete the assignment, and mail it back to the school, where a professional artist would critique it and offer suggestions. To design the courses, Dorne brought together the top artists of the day… Stevan Dohanos, Rube Goldberg, Milton Caniff, Al Capp, Willard Mullen, Virgil Partch, and Whitney Darrow Jr, among others. The result was a correspondence course that puts many current university programs to shame. 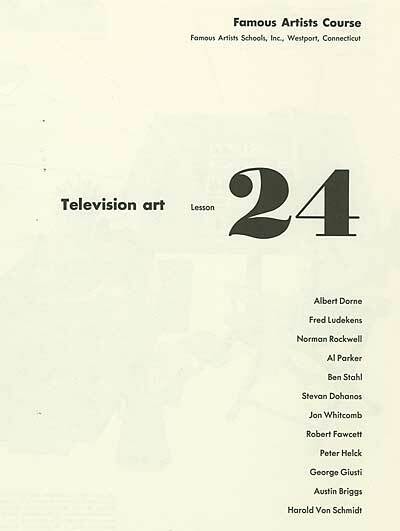 There were two editions of the Famous Artists Courses. The first was published in the early fifties, and the second was published almost 10 years later. 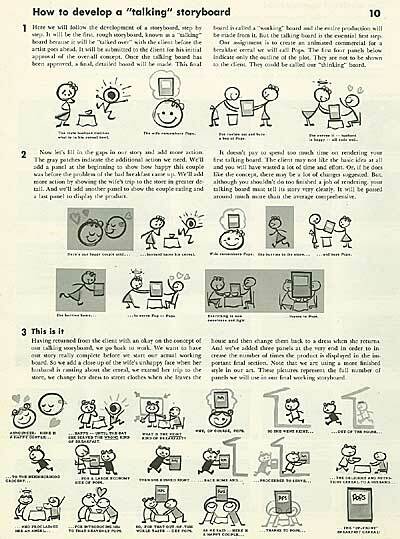 There were differences between the two, especially in the Design/Illustration course. 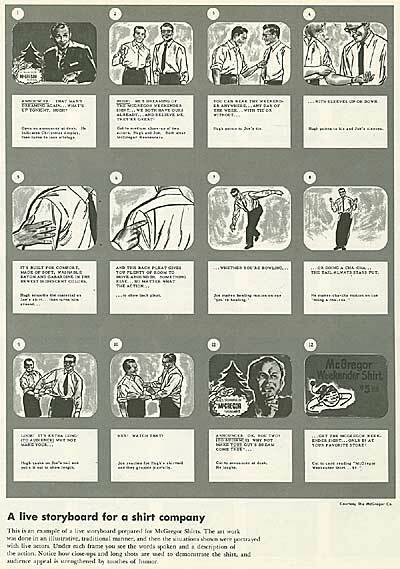 A concluding chapter written by the cartoonist known simply as “Chad” was added in the second edition. 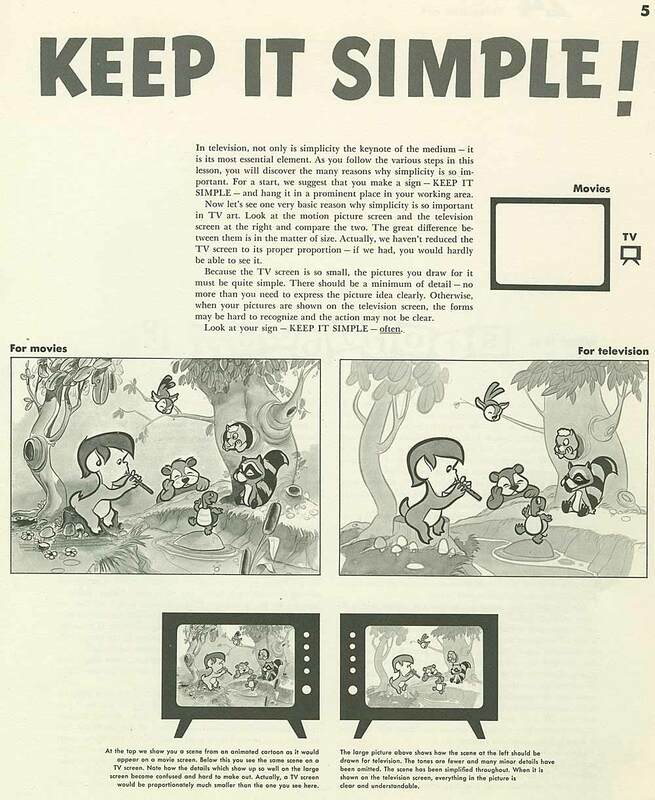 It deals with design for television. Chad (last name Grothkopf) was eminently qualified to write this chapter. After leaving the Disney Studios in 1938, he was hired by NBC to create the very first commercials for television. 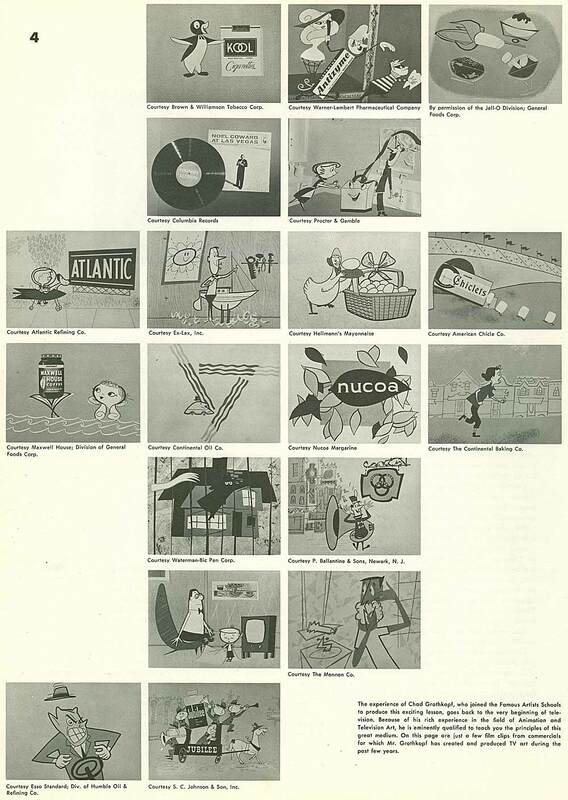 At this time, there were approximately fifty television sets in the entire country! 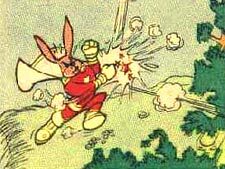 Chad also worked in comic books, most notably in Fawcett’s Funny Animals series, for which he created the character “Hoppy the Marvel Bunny”, a rabbit superhero. He passed away in January of 2005 at the age of 89. Animation Resources is fortunate to have a complete set of the Famous Artists courses, and we began digitizing them for inclusion in the database today. The first article we scanned was Chad’s introduction to the TV design chapter, and his discussion of the storyboard. These scans are quite large, but the size was necessary to clearly reproduce the text and details in this fascinating article. I hope you find them useful. The Famous Artists school is still in operation. Visit their website at www.famous-artists-school.com. 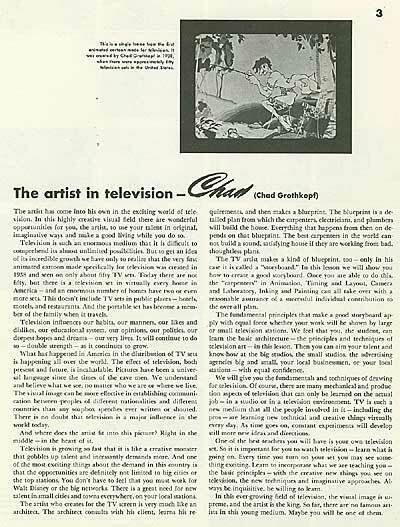 A couple of months ago, we posted a section of the Famous Artists Illustration Course… Chad’s Design For Television. Today, we are bringing you another Famous Artists article, this time from the Cartooning Course… Willard Mullin on Animals. 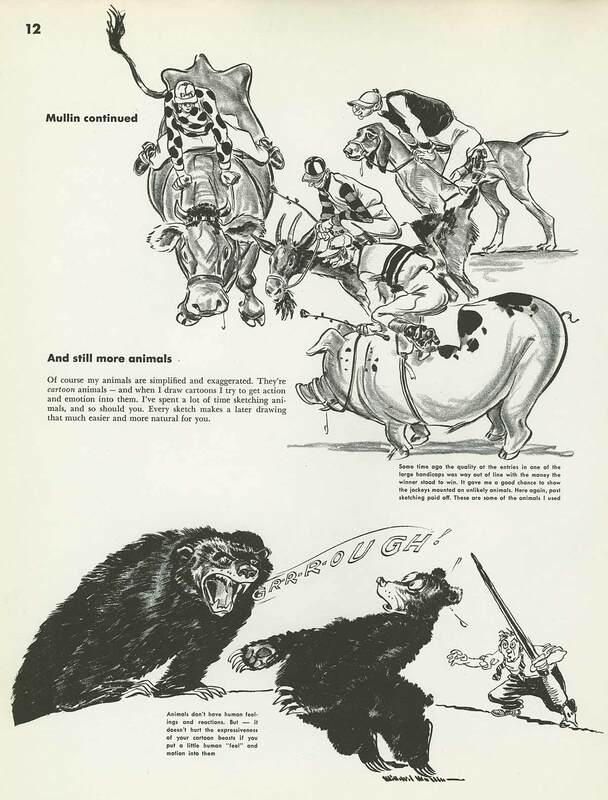 Willard Mullin was a type of cartoonist that doesn’t exist any more… a newspaper sports page cartoonist. 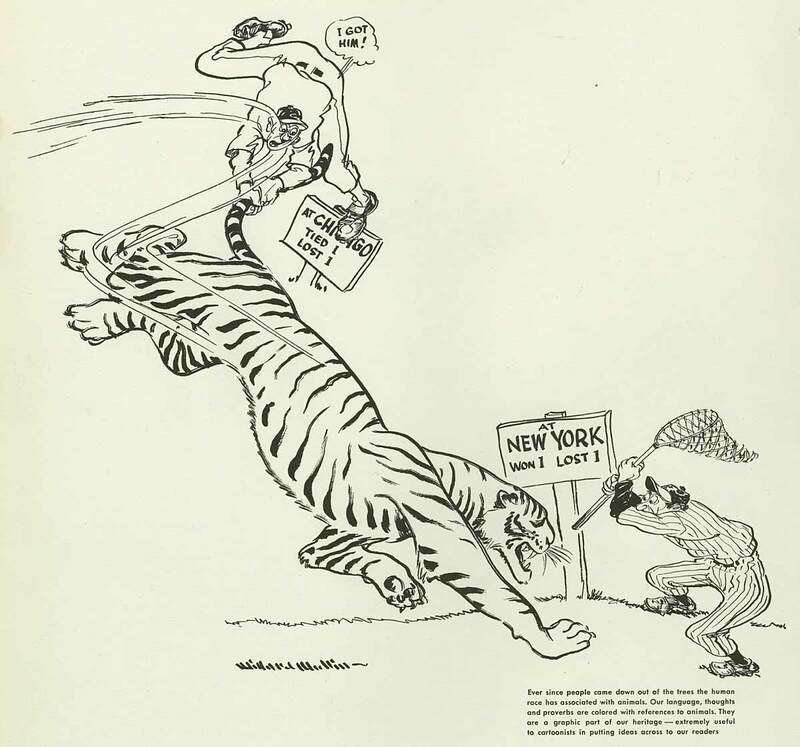 In the days before high speed film and well lit night games, newspapers relied on cartoonists to illustrate the sports stories that photographers were unable to shoot. They did this by caricaturing the players and utilizing team mascots to represent who was on top and who was in the doghouse. Mullin was not only the greatest sports cartoonist of his day, he was also one of the most talented artists ever to work in newspaper comics. His drawings are dynamic and full of energy and life. His lines flow beautifully, while still defining the solid forms that underly his drawings. 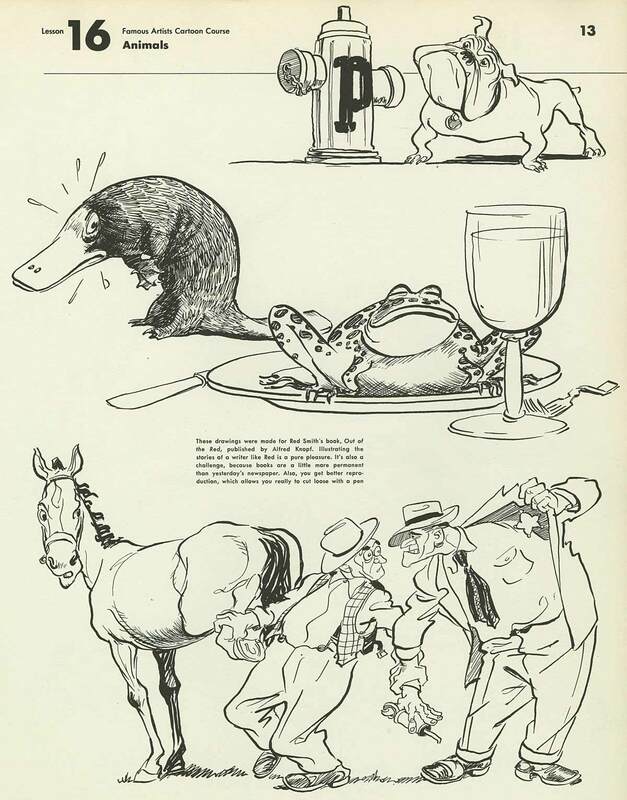 When it came to drawing animals, he was unmatched. 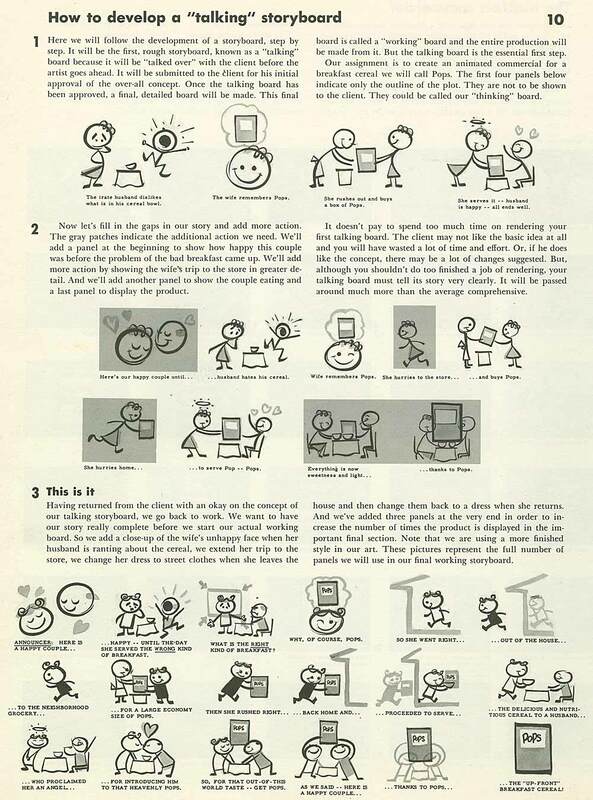 I hope you find this useful in your own work. 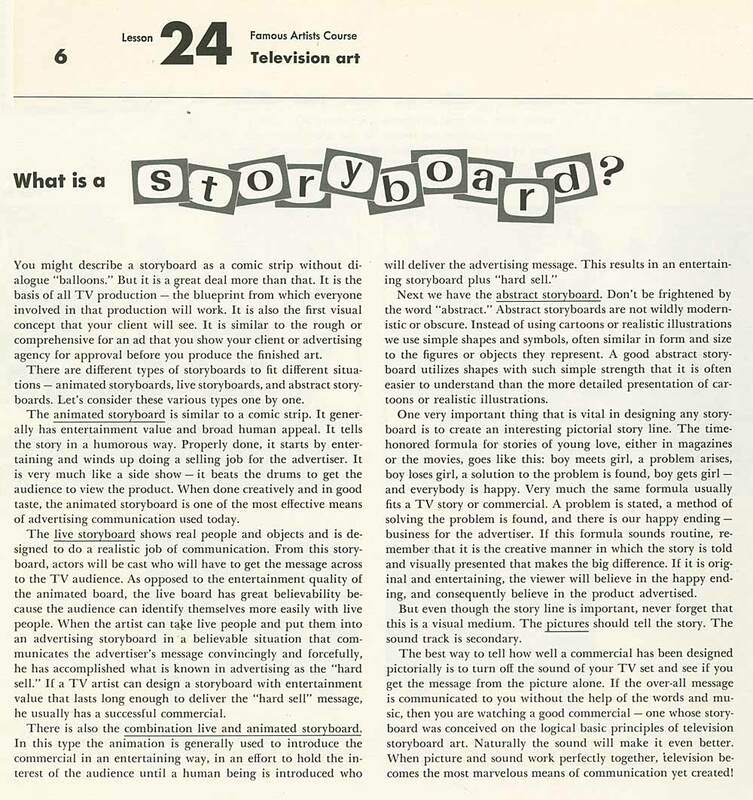 These pages provide just a small sample of Mullin’s work. If you can, find a copy of his book, "A Hand In Sports". 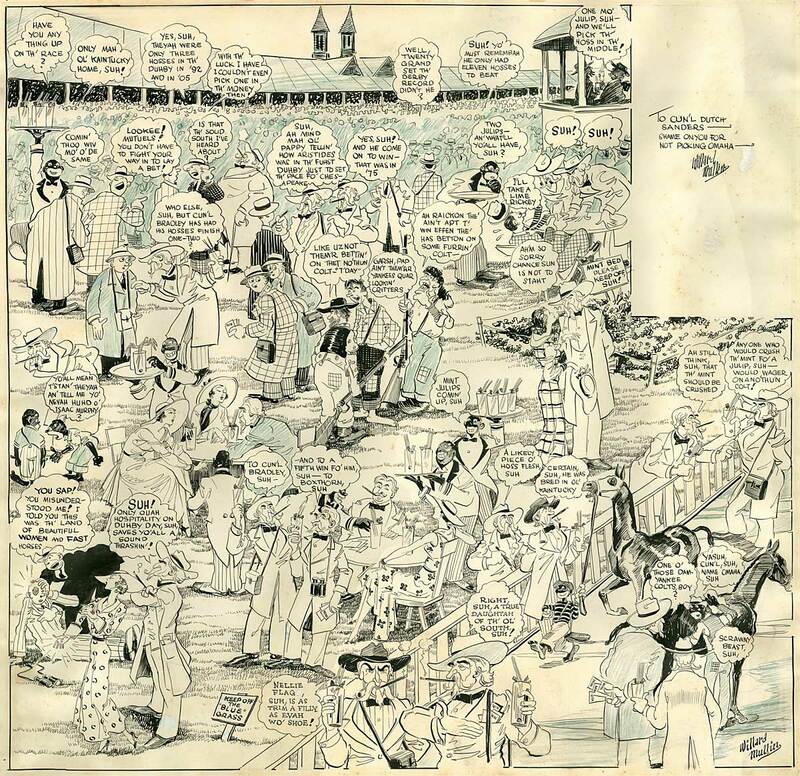 It’s packed with wonderful sketches by this underappreciated cartoonist. As an added treat, here is an early Mullin piece celebrating the victory of the horse, Omaha in the 1935 Kentucky Derby. 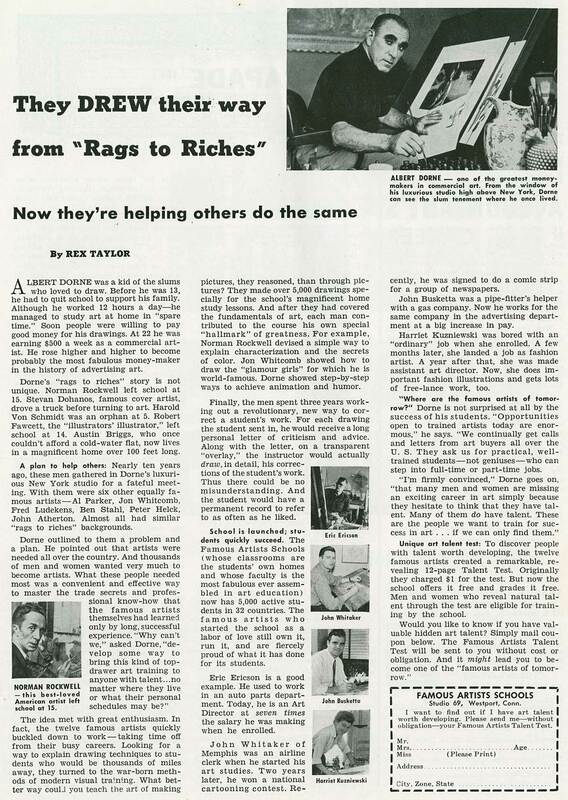 Archive supporter, Ted Watts found this treasure in a thrift store and generously allowed us to scan it for the archive. Amazing stuff! 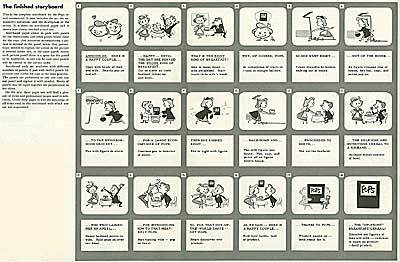 This posting is part of the online Encyclopedia of Cartooning under the subject heading, Editorial Cartoons.